Gabby on the Summit trail. I am not a mountaineer. In fact, I am not particularly athletic. So why would I voluntarily hike to the summit of Southeast Asia’s largest mountain? For me, summiting Mount Kinabalu was not about ticking off another peak, it was an opportunity to see rare birds and plants that are only found in this tiny corner of the world. 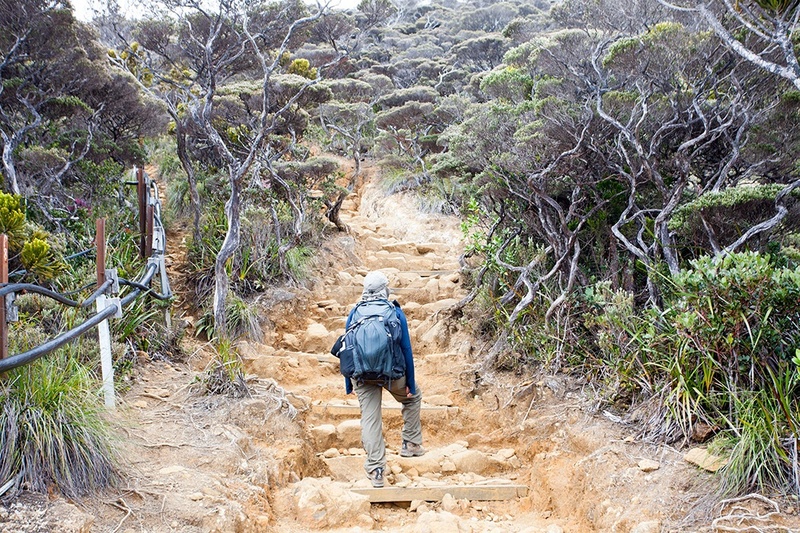 Although some insanely fit people hike Kinabalu in one day (in fact, the 23 kilometer round trip hike was completed in 2 hours 23 minutes by a man from Kenya last year . . . ), we opted for the 2 day/1 night trip. Our guide met us at park headquarters at 8am and we made our way by car to the Timophon Gate, the starting point of the summit trail. The hike to base camp and the Laban Rata Guesthouse was 6 kilometers and went from around 1900 meters in elevation to 3200 meters. It was a very steep and rocky trail, punctuated by wooden staircases, but both Rick and I had little trouble with the hike. To reduce weight, I only carried two lenses – a 17-40mm and a 100mm macro. The trail was spectacular – passing through cloud forest, mossy forest, oak forest, and stunted elfin forest. I could not understand the other hikers who jetted ahead, missing out on all of the spectacular sights along the way. 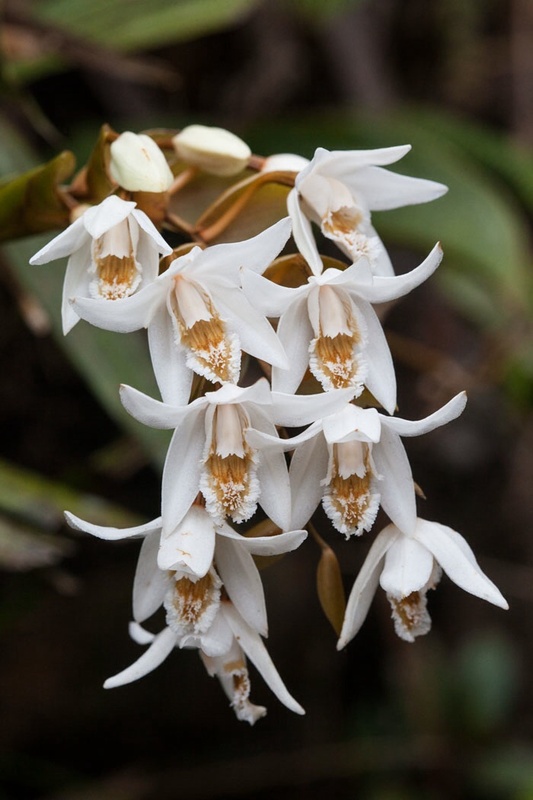 Although it is not the season for orchids, we saw at least seven species in bloom, from tiny yellow flowers to magnificent clumps of fringed blossoms. Pitcher plants also started to appear, some tiny ones growing out of the moss-covered forest floor and others hanging in bunches from the trees. At around 2500 meters, our guide took us on a small offshoot of the trail to show us Nepenthes Kinabaluensis, one of the largest pitcher plants in the world. 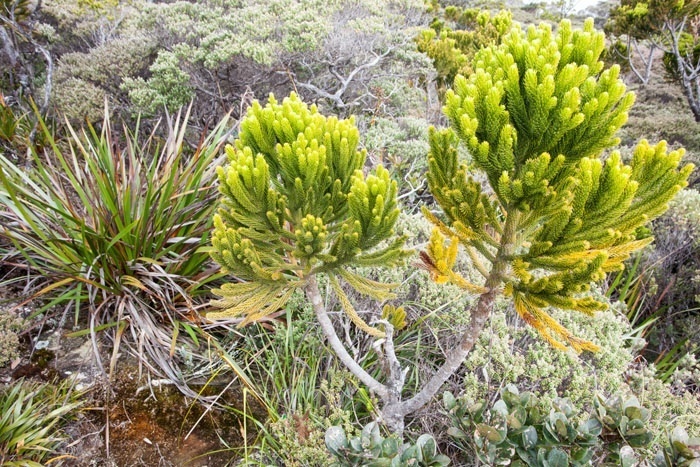 It also happens to be endemic to Mount Kinabalu. Pitcher plants are carnivorous, like the venus flytraps and sundews we learn about as children in the United States (we also have pitcher plants in the US -for Easton friends, you can see them at Tannersville bog). 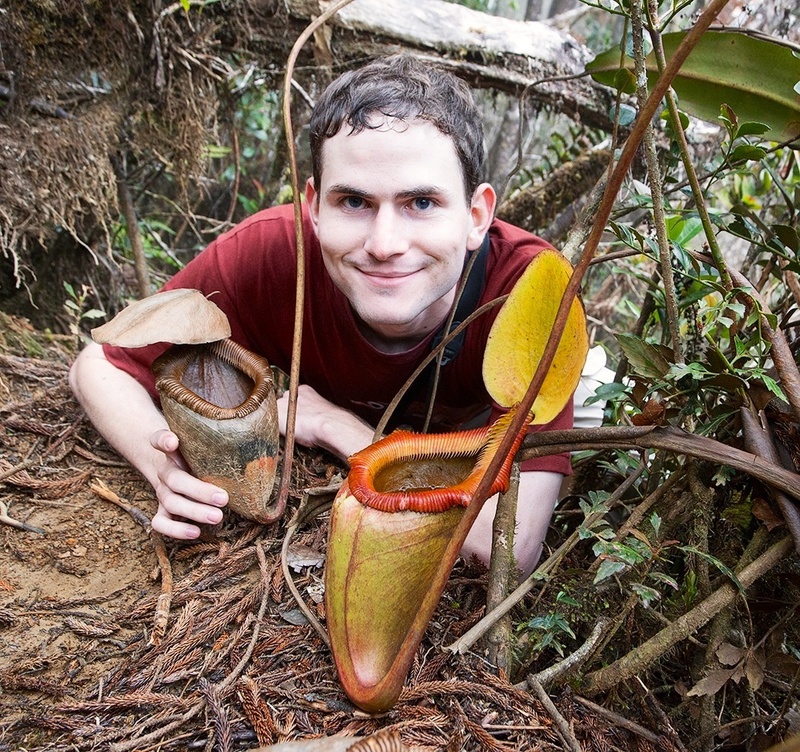 Rick with a giant pitcher plant (Nepenthes kinabaluensis). A little higher up the mountain, the character of the forest shifted. Gnarly, stunted trees were coated in red lichen and bizarre gymnosperms predominated in the understory. 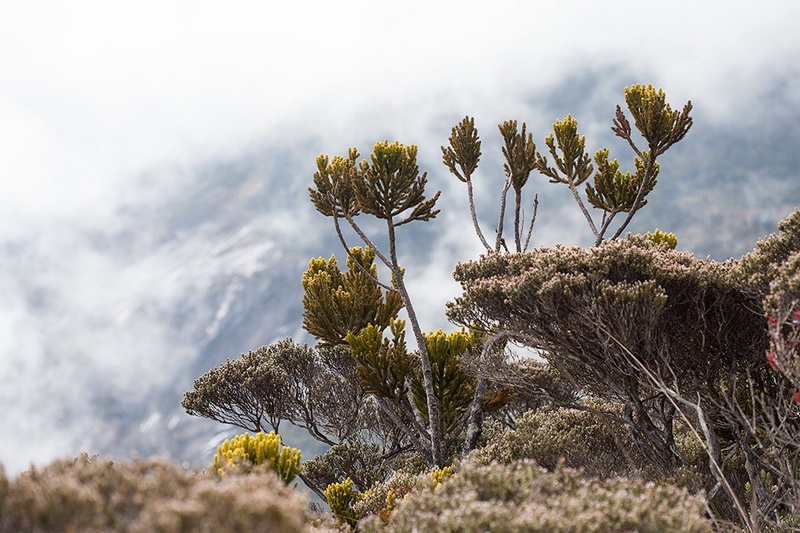 In the backdrop of this alien landscape, the spires of Kinabalu peaked out from the clouds. It started to rain about 1 kilometer from base camp, so we packed up the camera and trudged up the slippery slope. We arrived to find a heat-filled dining hall full of tired hikers. Thankfully, there was also hot chocolate and a buffet dinner service. We had been passing porters on the trail the whole day, many of them weighed down with 45 or 55 kilograms of supplies. 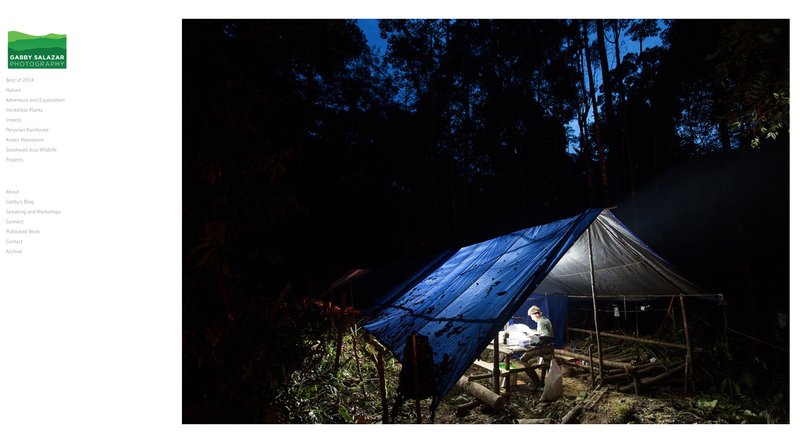 They are truly the unsung heroes of Kinabalu – making sure weary hikers have a warm meal and clean towels. We ate an early dinner at the lodge and sipped hot tea to stave off the freezing cold air outside. From the lodge’s balcony, we witnessed one of the most spectacular sunsets of our lives. The clouds opened up for a few brief seconds and the valley below was filled with light. The camera does not capture the glory of the moment – it flattens a never-ending ocean of land and mist into two-dimensions. We went to sleep at 8pm so that the 2am wakeup call would be a little less painful. We would hike the last 2.7 kilometers in the dark, racing to the summit before dawn . . .
A typical day in the forest . . .
Gabby, your blog is great… both the photography and your insightful commentary. I’m really enjoying it. Thanks for sharing this amazing experience with those of us who are State-side bound. I climbed Kinabalu in 1970, and your account brings back great memories. Your writing and your photography captures some of the magic. Thank you so much.